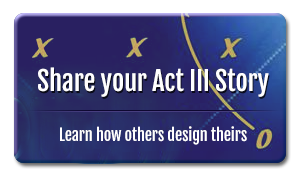 Act 3 has one major goal: all other goals support it. To find your purpose and live it fully. Our book supports the effort to help you find your purpose. The search for purpose can bog people down. They look to other people to help them find it; always thinking that they are far away from it. “If only I had money….” “If only I were different somehow..” then, the purpose would somehow appear. The truth is, your purpose is already within you. You have been expressing your uniqueness since the day you were born. The issue is, we do not recognize the things that make us unique. We overlook these things, because we think they are skills and traits that everyone has or enjoys. Even if we are lucky enough to have others point out our uniqueness, we doubt them or, in comparing ourselves to others, we downplay the strengths. How then, do we recognize our purpose? 2. How do others label you? We often fight the labels others put upon us. If people say you are organized you might respond “Well, I’m not THAT neat, I need to organize my garage better.’ We are afraid of uniqueness. We like to feel special, but we also want to experience being like others, thinking that the sameness will bond us to the group. We don’t like to be called out. However, this feedback may be giving us clues about how we can use that uniqueness in our purpose. Could you help others organize? How else do you exhibit this skill at home? At work? In volunteerism? Have you created a method of organizing that might be developed into a product? 3. Seek feedback from others. Choose 3 people you trust and ask them to answer the following 5 questions. a. What do you admire about me? b. What strengths or uniqueness might I have, that you think I don’t know about? c. What strengths or uniqueness might I have, that you think I do know about? d. What do I do that isn’t my strength? e. What do you see as my purpose? 4. When you see something you don’t think is right, ask, “What can I do to help…? Remember, that seeing a problem is a gift in that not everyone can see it. You are reacting to the situation because you know you have the ability to make it better. 5. Remember that we often don’t see our purpose until we have been doing it for some time. Take action and trust that you are headed in the right direction.